Click to enlarge. Top left: front view. Right: back view. 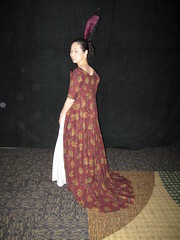 Bottom left: wearing at Costume Con 27 in 2009. 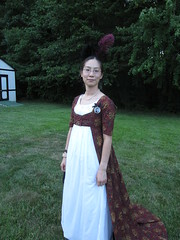 Right: wearing at a regency card party in 2011. Notes: Begun in October 2008, finished in November 2008. 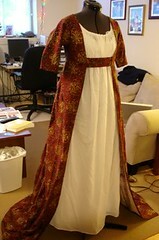 Main references were Costume in Detail by Nancy Bradfield (for the pleating of the skirt) and Costume Close Up: Clothing Construction and Pattern, 1750-1790 by Linda Baumgarten (for the construction technique used).